Slideshow photos of the tournament courtesy of Kristi Braun and other photographers. On Saturday, March 3, the OPEF 2018 Battle of the Bots set a number of records, including the most teams in attendance (42!) and the largest crowd of spectators ever. It also kept fans in their seats to the very end with 4 of the 6 schools competing in the final match! “This year’s Battle of the Bots tournament—which featured the VEX Robotics challenge game “In the Zone”— was a thrilling day filled with lots of offense and defense in front of a cheering crowd of over 300 spectators. Each match was a battle to move heavy mobile goals and lightweight scoring cones. Each team had to navigate the tiny arena and avoid the other robots to selectively and effectively own the zone. Autonomous programming was a highlight of this game, with several teams earning top spots in the final rounds with clever programming paired with impeccable driving. But, how did we get to such skill and such fine engineering this year? 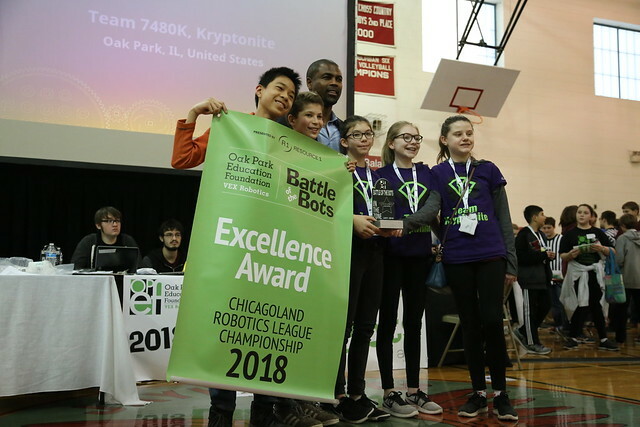 Thanks to our decision to create the new Chicago Robotics League this year, we had a season like no other before. We had excitement, like the thrilling victory of a pick-up game. We had our drama, with robots that didn’t work on the one day and the one time the students were able to compete. We had our teams that qualified early on in the year and then were fearful to change their design in case things went wrong. But this year was different, this year was cumulative, this year was a true season. “From our humble origins we have built something that has spread throughout our local communities. Something that has been bigger than the sum of its parts. Something that is built on the foundation of events that have occurred before. Like the methodical growth of hail stone trapped in the atmosphere, each event each month added a layer of understanding, honing the skills of driving and negotiating that eventually, gradually lead to success.